... okay, so now that you've eaten there, what did you think? We thought it was amazing. We went in October when they were not officially launched. So they did not have a full menu. The diner is located in a small plaza, and is quite cozy, as it only seats about 30 people, so if its busy, expect a little wait. But know its worth the wait. We can't wait to come back to try more. GF Diner is going to offer the great goodness that any diner offers, but all gluten free. We went on a Sunday afternoon and had no wait to be seated (we expect the no wait won't last long). We tried the Italian Pizzanini and the French Toast, all made to perfection and reasonably priced. The Italian Pizzanini is a panini sandwich that uses an in house made thin gluten free pizza crust grilled and stuffed with salami, mozzarella, hot peppers black olives, tomato sauce, herbs and served with fresh cut fried potato chips. 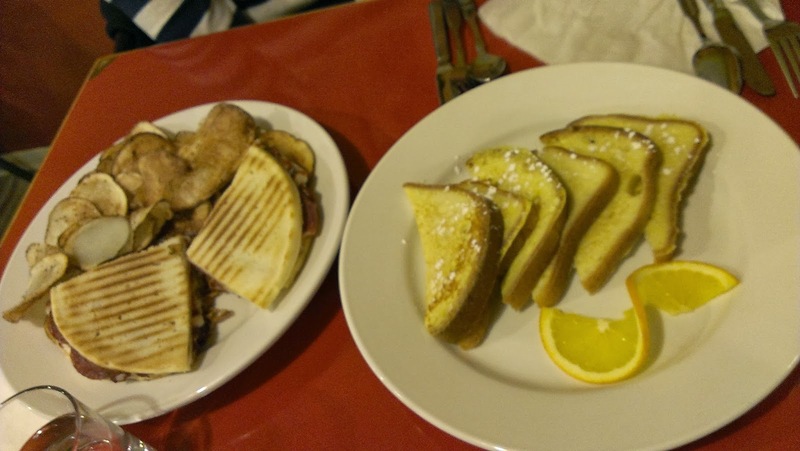 The gluten free french toast comes with three pieces of bread, cut in half to make six pieces. I recommend to order a side with the french toast, like bacon of the GF chips. The GF Diner is in full operation now with a full gluten free menu. Be sure to give it a try and support this diner that supports our Celiac community. Ted Wolff, the owner tells me that he looks to expand the seating into a section across the hall in the plaza as well as have a store front to sell goods. Great idea eh? Be sure to show them your support. I'm sure a store front in the south side of Edmonton will be welcomed, especially after the closure of Ed's Gluten Free Store.